Leading off today: Victor's boys soccer team started the season with four straight losses, but all's been well since. Spencer Ryczek's second goal of the game proved to be the winner for Victor. Andrew Crean and Justin Graham also scored in the victory. More boys soccer: Monsignor Martin Association rivals St. Joe's and Canisius played to a scoreless tie, with Chris Collins of St. Joe's making five saves in recording his seventh shutout in eight games. Last season, Canisius triumphed three times over the Marauders by 1-0 scores. goalkeeper Carter Rood, Syracuse.com reported. Rood, a 14-year-old sophomore, died of congestive heart failure at his home. "Monday we found out and had a team meeting at the end of the day. The boys and the girls teams came together and gathered for a prayer," Vikings coach Jake Preston said. "We talked about ways that we wanted to remember Carter on the soccer team and in the school. ... We spent probably the last five or 10 minutes and opened up the floor for personal stories. It was quiet at first but then they opened up. ... There was a lot of emotion in the room at that time." Last Monday's scheduled game vs. Madison was postponed. Cincinnatus scored three goals in each half Friday and defeated Otselic Valley 6-2. All-state QB done: Wayne quarterback Braeden Zenelovic is scheduled to undergo surgery on his right foot Tuesday and will miss the remainder of his senior football season. Zenelovic, who was fourth-team all-state in Class B a season ago, was injured during Wayne's opener and played a week later. A new evaluation found that he has a torn ligament and two broken bones in the foot, the Democrat and Chronicle reported. With Zenelovic unavailable last weekend, his younger brother Grayson, a junior, stepped in as the Eagles' quarterback. Grayson Zenelovic threw four touchdown passes while completing 11 of 21 throws for 180 yards in his first start. into a Sept. 8 locker-room incident that Superin- tendent Timothy Eagen characterized as "bully- ing," Newsday reported. Kings Park canceled last weekend's scheduled game. Eagen did not disclose the nature of the incident beyond terming it "more bullying than hazing," the paper reported. He added that the school never considered canceling the JV season. More football notes: Tioga and Newfield will not make up their Section 4 Class D football contest, which was called off Saturday after no game officials showed up. Both teams are 1-1. Albertus Magnus is trying to line up a late replacement for its Week 4 game after being informed that Kennedy Catholic has forfeited. Albertus Magnus was also the recipient of a Week 1 forfeit from Long Island Lutheran. College choice: Iona Prep senior basketball standout Josh Alexander has committed to American University. The 6-foot-8 forward averaged 13.3 points and 7.6 rebounds as a junior to earn 10th-team all-state recognition in Class AA. Seniors can begin signing letters of intent Nov. 8. 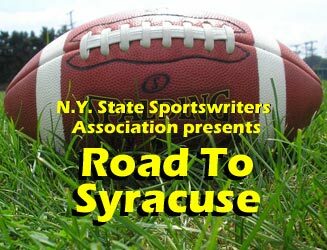 Now, online ads mostly cover the expense of providing rankings, news and reference material to readers of NewYorkSportswriters.org and its related sites such as RoadToSyracuse.com, which has allowed us to drop the membership fee. If you enjoy our content and feel inclined to help, we do maintain a page that allows contributions via PayPal or credit cards and encourage you to check it out. Extra points: The Journal News reported that veteran Blind Brook girls basketball coach Manny Martinez has been let go. He'd coached for 17 seasons and recorded more than 225 victories.